3M and Eckhart this week launched its 3M Automated Taping System (ATS), a collaborative robot-based automated tape application system that was jointly developed by the two companies. The new application is geared to assist the automotive and industrial market for their taping needs. The 3M ATS is designed and commercially available for automotive and industrial customers looking to automate manual processes involving 3M Attachment Tapes, the companies said in a press release. 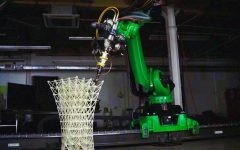 The new application uses industry standard robotic components and best practices to deliver a flexible, simple, and cost-effective solution, they added. Uses for the 3M ATS in the automotive and industrial space include applying adhesion promoters, creating extended liner tabs, and precisely positioning cut-to-length tape or die cuts onto components. Eckhart, based in Warren, Mich., engineers advanced industrial solutions, with a portfolio that includes AUTOCRAFT autonomous guided vehicles (AGVs), collaborative robotic systems, traditional robotics, contract assembly line design and simulation, 3D printing tool development and production, and ergonomic general assembly tooling solutions for large manufacturers. For more information, visit the Eckhart website.